Dr. Martyn Lloyd-Jones' influence on Evangelicalism in Wales did not wane when he moved from the Land of His Fathers to become Minister of Westminster Chapel in London in the 1930’s. In some ways his impact on Evangelicalism in Wales grew during the years of his London-based ministry. A new generation of young men converted in the 1940’s and called to pastor churches in the theologically mixed denominations looked to him for spiritual inspiration, theological guidance, personal advice and leadership. Some of those men organised an annual Ministers’ Conference in the mid 1950’s that nowadays meets each June in the beautiful setting of Bala, north Wales. From its beginnings until he last attended the conference in 1978 Lloyd-Jones had a huge impact on the gathering. He chaired the discussion sessions and often gave the closing conference address. The ethos of Bala Ministers’ Conference was very much shaped by Lloyd-Jones, with its strong emphasis on prayer, preaching and revival. 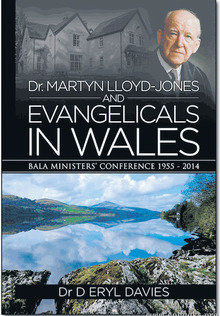 The period in which Lloyd-Jones attended conference was one of great change for Evangelicalism in Wales. Many ministers faced the issue of secession from the mixed denominations. The challenges thrown up by the ecumenical movement forced them to go back to first principles and ask, ‘What is a Christian?’ and ‘What is the Church?’ The burgeoning Charismatic scene prompted reflection on what is and what is not a genuine work of the Spirit. Attending the conference as a younger Minister in the early 1990’s it seemed to me that the answer to almost every problem raised for discussion was, ‘we need a revival’. Discussions were often brought to a juddering halt when an old timer quoted something that ‘the Doctor’ had said some years earlier as if he was an infallible oracle. However, as Davies points out Lloyd-Jones would have deplored such a tendency and always encouraged men to think for themselves. While he believed in revival, he was also very much an evangelist and spoke of the need to be active in the Lord’s service in season and out of season. The conference today seeks to maintain its focus on preaching the word in the power of the Spirit, while endeavouring to equip men to minister effectively and fruitfully in the contemporary setting. If it wasn't for my dislike of the dormitory sleeping arrangements, or, more accurately, the not sleeping because of other Ministers' snoring arrangements, I'd probably attend more frequently myself. Eryl Davies tells the story Lloyd-Jones and the Bala Ministers’ Conference with gripping simplicity. The bite-sized chapters make for easy reading and a fast-paced narrative. The author is not unaware of criticisms of the man and the conference and seeks to respond to them honestly and graciously. The final two chapters attempt to sketch out a theology of Word and Spirit in preaching. A number of appendices include notes on Lloyd-Jones’ addresses at Bala. His stirring emphasis on our need to see the living God at work among his people deserves to be heard afresh today.